Known as the “trail blazer” for geometric abstract art, Kazimir Malevich’s collection of unique pieces were simple in design, but heavy in thought and intention. 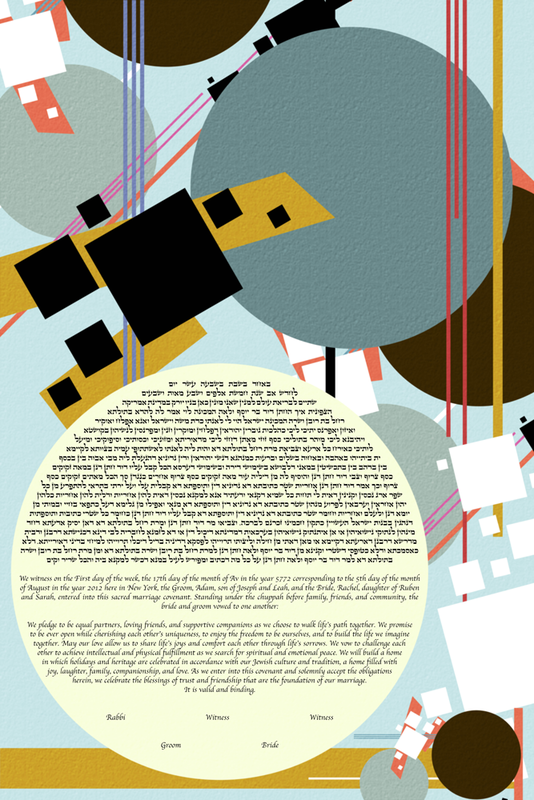 The Squares In The Air Ketubah utilizes Malevich’s geometric style and blends it with the Ketubot tradition, to make for a work of art that is truly original! This Ketubah contains a textured feel with simple shapes that overlap to create depth and layers to the design. The Ketubah text is circularly framed and incorporates itself seamlessly into the overall design and theme. Although simple in design and color, The Squares In The Air Ketubah contains so much more than that! Perfect for the couple that is not just looking for something minimalist and modern, but that will truly emphasize the thought and purpose behind the important Ketubot tradition. This Ketubah will beautifully match your contemporary style and most importantly, your values, beliefs, and love!